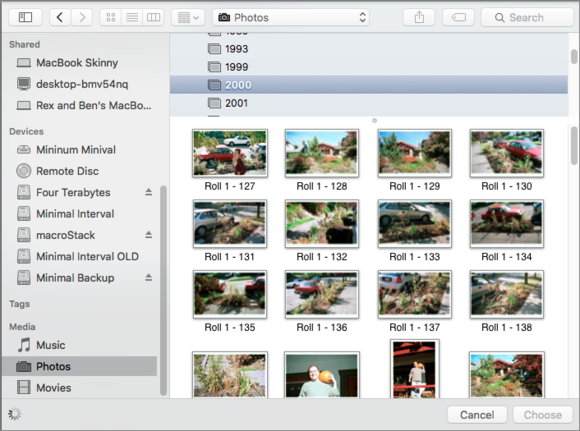 Navigate to a photos library and select your images. Reader Stephen Love writes in about uploading photos that are stored in Photos or iPhoto to websites. He knows he can navigate to a photos library—an OS X package that can be opened—and find media inside there. But he wants to be able to select images as they appear in Photos or iPhoto. You should be able to use a media browser, sometimes labeled or described somewhat differently among various Apple software, desktop user interface, and third-party apps. In Pages and iMovie, there’s a labeled option to browser your main and alternate media library, including offering options for both iPhoto and Photos if you’ve retained libraries in both formats. Every selection dialog should let you browse media libraries. However, in any OS X app that lets you select a file for upload or editing—so long as it includes media formats—scroll down in the sidebar and you should find a Media section that lists Music, Photos, and Movies. Click Photos, and you’re further offered supported apps. I have one older app, my email client, that only shows iPhoto and Photo Booth. However, Firefox and Safari both also list Photos as an option. Select the app type, and you’ll be able to drill down to years, moments, albums, collections, and other division depending library type. One worthwhile note, though. 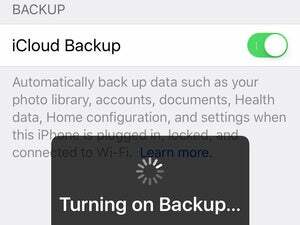 If you’ve selected to optimize your Photos library when syncing with iCloud Photo Library (Photos > Preferences > iCloud, Optimize Mac Storage), Apple warns that you have to set up an album and force a download of all included media to make it reliably available.